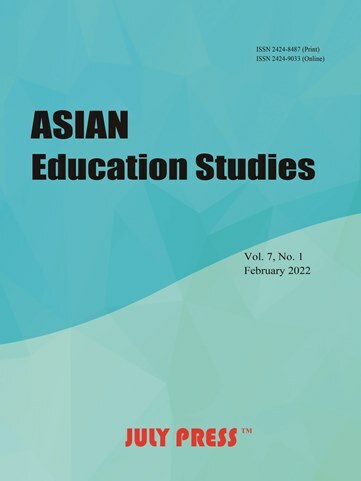 Asian Education Studies (AES) is an international open-access and peer-reviewed journal published by July Press. This journal is published in both print and online versions. The online version is free to access and download. The journal accepts article submissions both online and via e-mail (aes@julypress.com). Asian Education Studies is inviting submission of papers for publication in the forthcoming issue of Vol. 4, No. 1, June, 2019. A length between 3,000-10,000 words is preferred. If you are interested in submitting a paper to this journal, please review the Author Guidelines to see how to submit a paper online. If your paper is accepted for publication, a publication fee of only 300USD is required to pay. The corresponding author will receive two hard copies in addition to online publication in PDF version. Online Version First is a featured way of publishing articles in our journal. It allows PDF version of manuscripts that have been peer reviewed and accepted, to be hosted online prior to their inclusion in a final printed journal. Readers can freely access or cite the article. Each paper published in Asian Education Studies is assigned with a DOI®number, which appears beneath the author's affiliation in the published paper. Click HERE to know what is DOI (Digital Object Identifier). And click HERE to retrieve Digital Object Identifiers (DOIs) for journal articles, books, and chapters. If you submit your manuscript online or through the journal email, you will receive an email of confirmation from the editorial assistants within 1-2 working days. The editor or editorial assistant determines whether a manuscript fits the journal’s aim and scope. Then, the manuscript is checked for its similarity index by CrossCheck, powered by iThenticate. We use double-blind system for peer-review. Both reviewers and authors’ identities remain anonymous. A manuscript will be peer-reviewed by at least three experts: one editorial staff and two external reviewers. The review process may take 2-3 weeks. The decision to accept or reject a manuscript is based on suggestions of reviewers. If differences of opinion occur between reviewers, the editor-in-chief will weigh all comments and arrive at a balanced decision based on all comments, or a second round of peer review may be initiated. Step 5: Notification of the result of review to the corresponding authors by E-mail. The authors are asked to make revisions based on comments from both the editorial board and external reviewers. Then, they should pay a publication fee (300USD) for an accepted manuscript. Manuscripts will be shortly published online upon completion of revision and payment of publication fee. Printed version will be published in the scheduled volume and issue. Online PDF version of a manuscript is free to access and download. After publication of the printed journals, two hard copies of the journals will be sent to the corresponding author.